Is it okay if I call you dude? I call the babies dude. I think they like it. Matter of fact, I know they do because every time I say it they get a little pool of vomit right in the corners of their mouths. And if that’s not a sure sign of loving being called dude I DON’T KNOW WHAT IS. Today’s recipe actually comes straight from the hands of my mama! But I’m saying it like they say in Downton Abbey, with the accent on the second half of the word, maMA. Can you imagine if they said it like Americans say it? MAWmuh? Lord Grantham, “May I present to you, The Dowager Countess of Grantham, my MAWmuh.” Good heavens, sick. Anyway, my parents came up last week to spoil the babes plain rotten so I could catch up on doctor’s appointments (Instagram), house cleaning (Facebook) and blog work (naps). Mom brought some old recipes from her “early married life” repertoire and learnt me on some good old fashioned fried pork! Well, not really FRIED fried. Just pan-seared until nice and golden brown. Are we still friends? It was cute, as she was hand slicing each potato she rolled her big browns and said, “Back when we were first married, this took me FOREVER to prepare. I’m not even going to tell you what your father would say as he loomed like a tree in the kitchen doorway.” Then I introduced her to the mandolin, watched her salivate a sea, and chirp to my dad, “Tim! Christmas list!” And all was well in the world. Wait, did we ever decide if it was okay if I call you du- never mind. 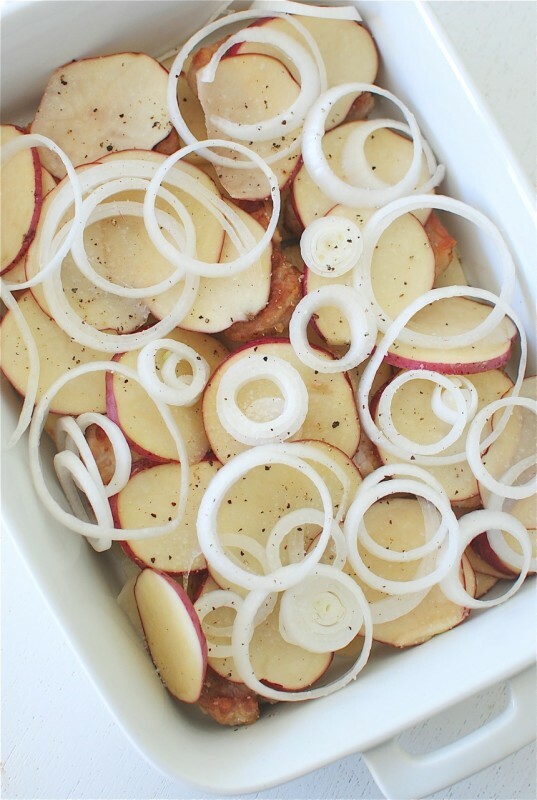 Thinly sliced potatoes and onions. Topped with bubbling sharp cheddar. I’m calling you dudes and you’re gonna like it. Arrange the bottom of a 9×13 baking dish with half the potato slices. Overlap just tad. Then arrange the browned chops on top of the potatoes, followed by the remaining potato slices. Then arrange the onion rings on top of the taters. Sprinkle with a little salt and pepper. Pour the cream of mushroom soup into a medium bowl. Fill 3/4th of the can with water, then add to the cream of mushroom. Whisk to combine. Evenly pour over the casserole. 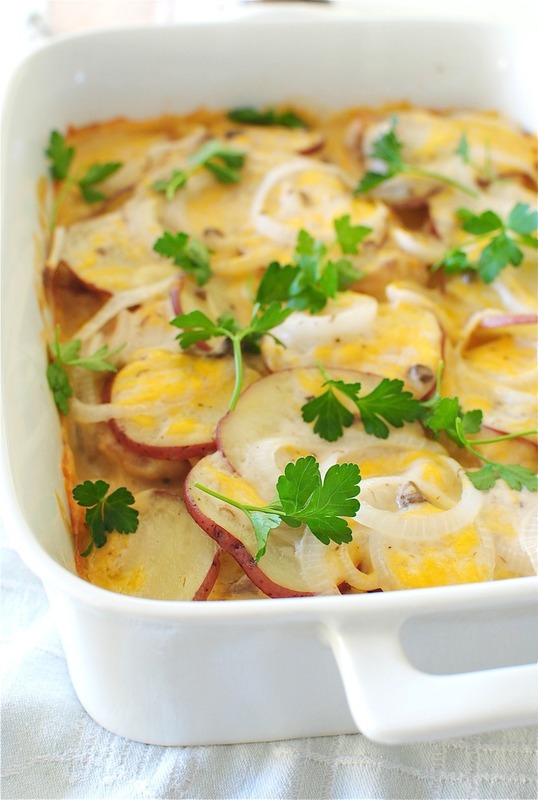 Top with shredded cheese and bake for 30 to 45 minutes, or until the potatoes are tender and fork pierce-able. Then start a band called The Fork Pierce-ables. I’m already so happy for your life. A family dinner that I actually think everyone would eat. Yes! Looks awesome, Bev! Actually, it's in the recipe! Very first sentence - 375. Let me know how it turns out! is that C or F? I doubt if your oven goes up to 375C which is about 707F. Can you use bone in pork chops? OMG. that would be over 700 degrees in C. Lol. Fabulous tasting, easy Casserole! Thanks! My husband was just complaining that I don't make pork chops often enough. I'm not sure I've should make him this to be nice, or hide this recipe forever to teach him that complaining about me gets him nowhere. Advice? Karly, That would be like cutting your own nose off to spite your face. lol. You would miss out on what sounds like a fabulous dish. Enjoy!!! Karly, perhaps you growing up would help? Pretty sure it's a joke, perhaps you should lighten up? Wow, common sense is less common that we thought. These chops look really good!! Must try, dude! Ohhhh this looks so yummy. My fiancé and I are about to be all over this. Looks delicious! Can't wait for April, when my momma, or mamma (as we say in Swedish) comes to visit all the way from Sweeeeden. I will definitely be featuring her recipes on my blog. Love that you mentioned Downton Abbey. By the way - when did Lady Mary learn how to cook scrambled eggs? Just out of nowhere did she make eggs for Mr. Blake (after the pig wrestling). Carson would be appalled. You need to actually have show on the Foodnetwork - so we can all enjoy you in action. My mom gave me a cast iron skillet for Christmas one year and commented that she thought I was old enough (read: responsible enough) to handle one. I almost ruined it and burnt down my apartment the second time I used it and her comment was, "Well, maybe you weren't ready." and started laughing. Anywho, the point of that ramble is that I am not sure I can handle such adult things like mandolin's yet. Plus, I would be deathly afraid of losing a finger. So I think I will stick to a knife when I give this a try. Pure comfort in a casserole! Looks mouthwatering, Bev. I love comfort food like this! The Downton Abbey crew would totally approve. Also, looking at your babies on instagram totally makes my day. My husband is weirded out by this since we don't have any babies and aren't planning to any time soon but I CAN'T HELP IT. so adorable. I love fried meat! Bring it! How many calories in this beauty? Gosh, I'm not sure. I know there are calculators online that you could use! I think Will and Natalie are young enough that you should absolutely teach them to call you maMA. They won't know it's weird until it's too late. DO IT! Just made this recipe but used cream of brocolli and added green and red peppers and layered potato, porkchops, onion cheese and did that twice. Took a little bit longer to cokk but came out soo good! I wish I liked potatoes because this looks really good. I am wondering what other vegetable might work just as well?? Any ideas? Don't like potatoes?! Oh man. I can't imagine such a life. I'm trying to think of other veggies that might work well. Maybe fennel? Something that can take being baked without getting too soggy. Thick zucchini or squash slices? Let me know what you come up with! Parsnips work well. So do turnips or rutabagas. How about some celeriac? Tried that and it works really well! Your parents seem hilarious! My boyfriend would LOVE this dish, I definitely have to add this to a meal plan for the week. Is it weird that I can smell this just by looking at it?? smelling with my eyes... totally normal. Must be a Canadian thing. I like that they (your parents) realized that you as new parents (how do we escape our reality) have grown-up responsibilities to forge forth with (marathon watching of Nashville.) It's what all grandparents are made for. And nice p.c. casserole too. Oh my, this will be Sunday dinner. Can't wait to try it. You are the queen of dudeness. This casserole looks amazing, and your mama sounds sweet. Perfect family dinner dish! I love how creamy this dish looks! You don't have to cover it! Just keep an eye on the cheese, just in case it starts to brown. I think I just heard Ben whisper your name in hushed and quiet tones - Pork Chops are his FAVORITE!!! Sooo I think I have to up my pork chop game with THIS! after this amazing recipe you can call me anything you want! Oh man, this looks amazing! 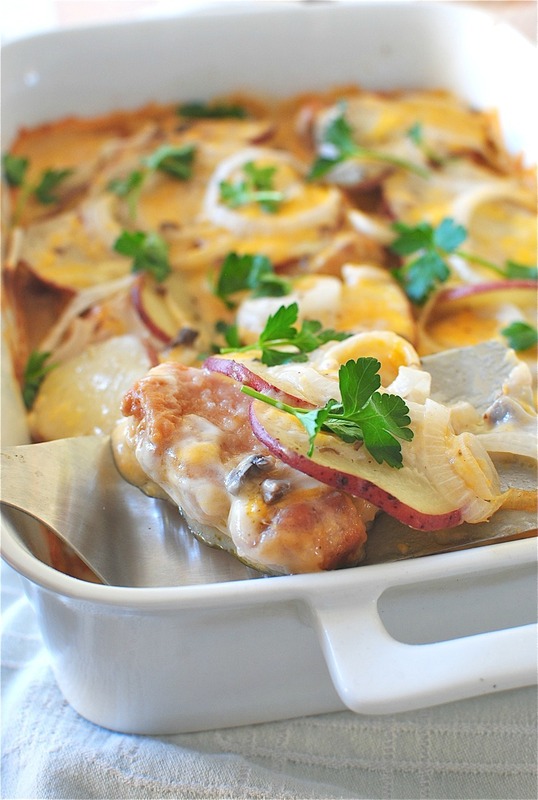 I love pork chops :) this casserole looks satisfying! I made this last night for my entire family, and It was WONDERFUL. I did, however, add some thyme and rosemary to the dredge. I did not have my Mandolin slicer since i was cooking at my mom's house, so my potato slices were done by hand. I opted to cover the dish just to make sure they would cook fully in the allotted time. Now this is a winning recipe. I like Yrina's idea to add thyme and rosemary to the dredge. This is a great recipe for family and for guests. I have an obligation for a meal for when I gather with a small group of women. I can make this ahead and not have to miss out on the conversation and of course the margaritas!!!!! It is making me smile thinking about it. Bev!!!! these are amazing!!!! i made this last night and man i was dreaming about the dish this morning. how can these simple ingredients create such amazing flavor?! thanks for sharing. making your chicken puffs tonight....can't wait. Not a fan of creamy soups. would simple chicken broth be a good substitute? Hey, Hal! I'm all for trying variations, but I have a feeling it might make the casserole a bit thin and soupy. I could be wrong! The cream gives the whole thing a little more ooomph. But try it and let me know how it turns out! make your own. i use butter and flour, like a rue, add the broth and a little milk, S&P to taste, and if you want you can add stuff to it, i.e. sauteed mushrooms, celery, any sauteed veg, whatever, or leave it plain. I add tuna to the plain and have it as a late night snack over buttered toast points. 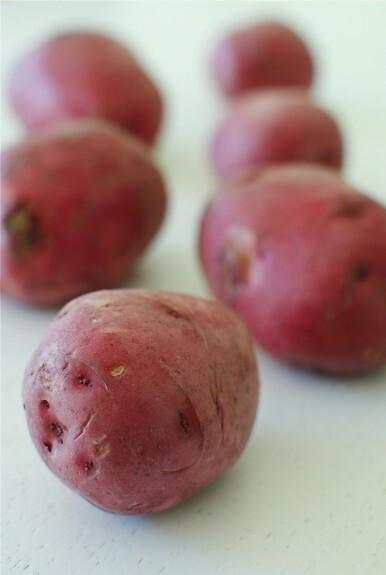 Can you use regular potatoes? My husband's favorite meal of all time is pork chops and scalloped potatoes - like his mother makes. I figured out very quickly after we were married nearly 39 years ago that it was imperative that I learn to make this meal like she does. I mention all this for Hal, who doesn't like cream soups. 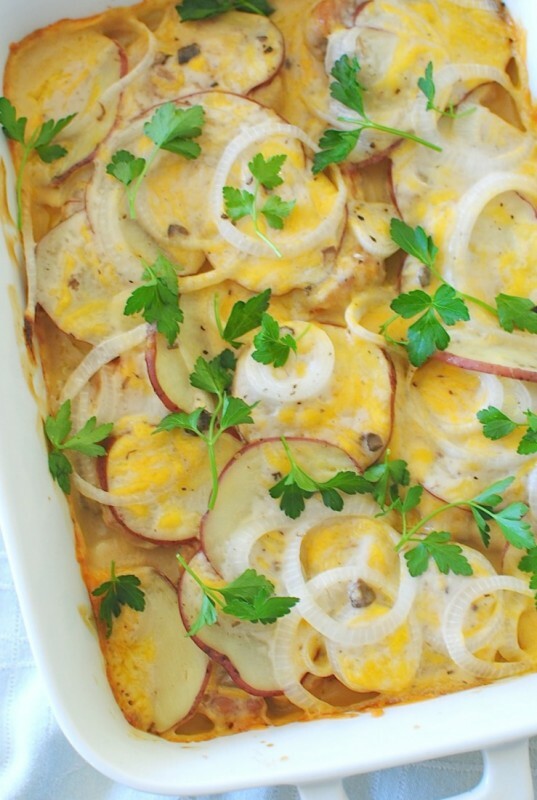 My dear mother-in-law makes the easiest scalloped potatoes ever, and they are delicious. No cream-of soup. 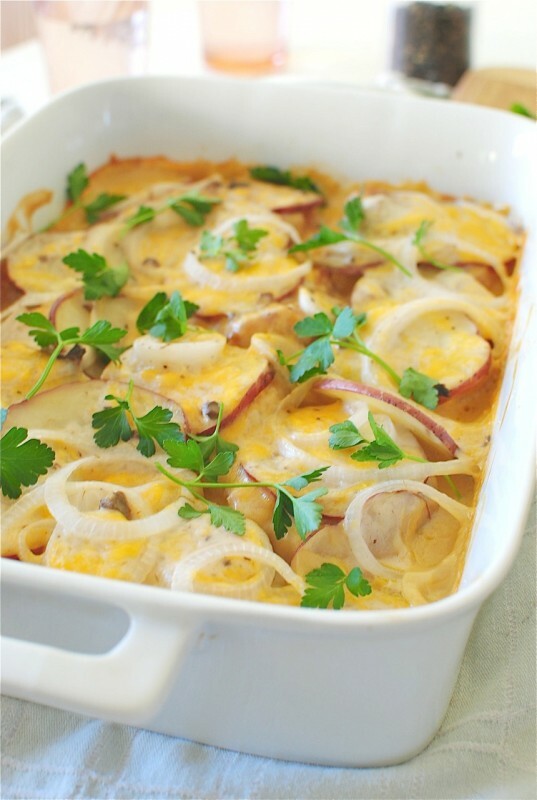 Layer thinly sliced potatoes and rings of onion in a baking dish. Pour milk into the dish almost halfway into the potatoes and onions. Sprinkle with salt and pepper. Then lay bacon slices over the top. Cover with foil and bake at 350 for about 40 minutes. Remove the foil, and bake another 10-15 minutes until potatoes are fork tender. I've also done this without the bacon, and put pork chops over the potatoes instead. Nearly the same dish as on this blog, and so good! "That, or His Dudeness … Duder … or El Duderino, if, you know, you're not into the whole brevity thing." My husband was JUST giving me grief for still having some pork chops in the freezer... they are coming out tonight for pork chop casserole tomorrow!! Thanks for this recipe! I followed it from allfreecasseerolerecipes.com. Can't wait to try it - I have thawed chops in the fridge and just didn't feel like doing the garlic/basil rub like we usually would. Now I need to find a recipe for homemade cream of mushroom because we just don't subscribe to premade soups. My husband has a recipe stuffed in his brain but he's working tonight so it's all me, and I won't "cheat", lol.Thanks again, Bev, this looks and sounds DELICIOUS! do you cover the dish with foil when baking? No need to cover. Let me know how it is! this recipe sounds delicious, we aren't crazy about mushroom soup, would cream of celery do just as well? I bet that would be just fine! Can I use cream of celery or cream of chicken? I'm allergic to mushrooms. You sure can! Either will work just fine. This recipe was amazing. My hubby and daughter (2 1/2 years old) loved it. The thing is... they don't like potatoes. As a matter of fact, this is the first time in all my daughter's like that I was able to get her to eat potatoes without a fight. And she kept coming back for more. So did my husband. He is already asking when I'll make this recipe again. Total winner. I did add some additional seasoning to the cream of mushroom but stayed very close to the original pisted. Thank you! I am suuuure that would be just fine! I just put this EASY casserole (or as us Minnesotans say: hot dish) in the oven. Looking forward to eating it. Love the pork, I used pork steaks. Thank you!!!!! These have been on my 'must make' list for a few weeks now and I'm finally going to try them out tomorrow. Can I brown the pork, assemble everything and put in the fridge until I'm home from work to bake? I only have bone in pork chops, do I need to adjust the cooking time ? Just now seeing this! So sorry. Did you already try the recipe with bone-in? I'm not sure if you'd need to adjust the time or not. I imagine maybe a little, but I'm not 100% sure! How was it?! Made this tonight. It was so good!! My family loved it. I'm not a big fan of cream of mushroom but it actually fit well in this recipe. What could use instead of cream of mushrooms? 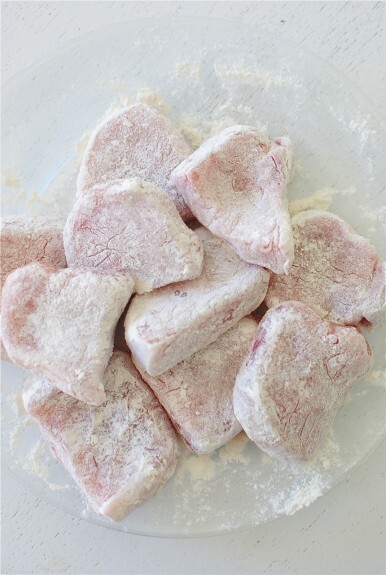 How long do you cook the pieces of pork chops for in the pan first? Dude! My husband and I just devoured this. Dibs on the pan, because those are some serious old school pan scrapings. It's in his beard. Made this over the weekend and my husband LOVED it (he generally doesn't love pork chops). Very tasty! I made this last night and I accidentally bought tomato soup instead of CoM. I didn't realize until it was time to stir up the soup and dinner was already late, so I used the tomato soup. It was so good! I highly recommend it! I used half the amount of water and heavy cream for the rest of the liquid. Thanks for the recipe! I used cream of celary. It was delicious. Just made this for dinner with my wife, AMAZING!!! We both agreed this is going to be a regular in our house! Also my mother in law now has this as well lol! Thank you so much for sharing!! This is so delicious. Thank you. I make something similar to this. I learned to cook the old fashioned way, all from scratch but learned a few shortcuts along the way. My dish that is similar but turns out almost the same is: I brown the pork chops and slice potatoes/onions as in this recipe but I also add minced garlic and sliced mushrooms (any that you like). I saute the mushrooms and garlic with some of the onions. I place 1/3 of the potatoes onion, mushroom mixture and cheese on the bottom of a buttered casserole dish, add the browned pork chops then two more layers of the potatoes, mushroom mixture, onions and cheese, saving a little cheese for the top and salt/pepper each layer. Then I pour 2/3's heavy cream to 1/3 chicken stock over the entire thing and pop it into a 400 degree oven with a lid on it. cook till it starts to bubble, about 15 minutes then turn down the heat to 375 and cook for an hour. The heavy cream/chicken stock mixture will thicken without the need to add flour or extra butter. It's essentially au gratin potatoes with pork chops hidden inside. It tastes just as good without the mushrooms also. Did I miss a "print " button? If it's not there, I wish it had been. How thick should the pork chops be? Is this web page still open for question or is it close for 2018? can you use milk instead of the water in the soup ?